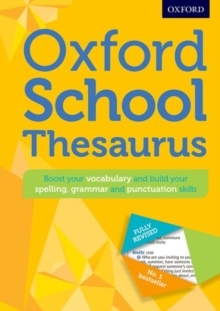 This authoritative new edition of the bestselling Oxford School Thesaurus boosts vocabulary and improves writing skills through new curriculum support. With the help of the Oxford Children's Corpus, the largest bank of children's language in English, the thesaurus is able to proivde a range of carefully-levelled words, synonyms and antonyms and age-appropriate example sentences. These are written in the natural language of contemporary children usingcontexts that will make the thesaurus easy and enjoyable for every child to use. Phrasal verbs, idioms, and writing tips help to explore the richness of language and make writing more effective, whether in creative writing or in essays, projects, reports and letters. A writing supplement with spelling, grammar and punctuation support makes this a complete toolkit to enhance basic literacy skills, build confidence, deliver the curriculum and help children prepare for the level of writing expected at secondary school. As with all Oxford children's thesauruses, it has been trialled with teachers. A perfect buy, in a resilient hardback format with a refreshing new look, an essential for any bookshelf.